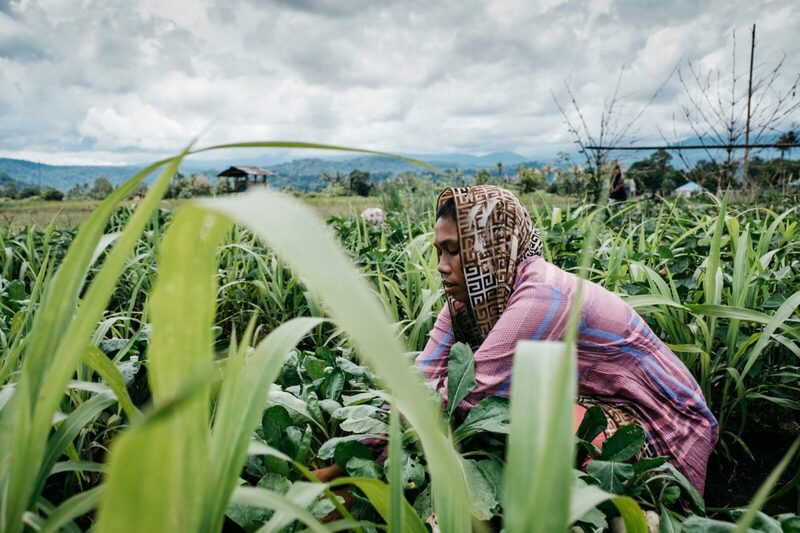 A member of a KI-supported women’s cooperative harvests vegetables from her allotment in a community garden. 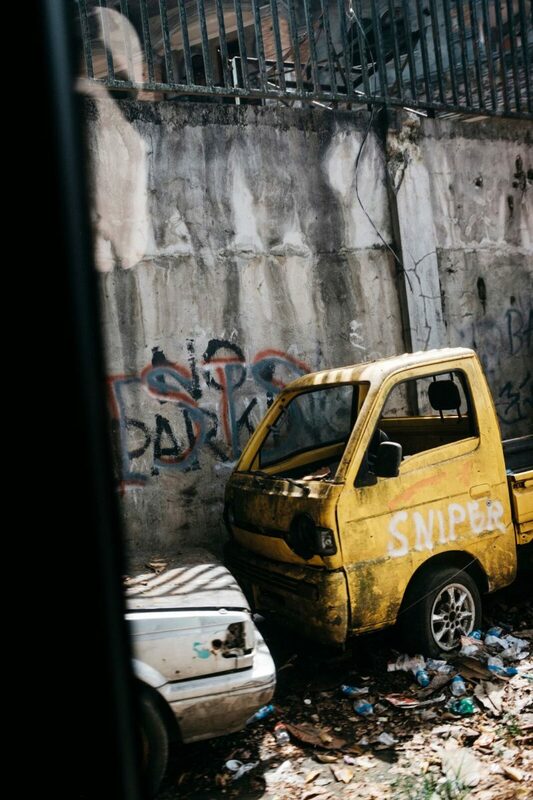 After militants ransacked Marawi in 2017, the future of this island city in the Philippines was uncertain. In the months since the outbreak of the violence, nonprofit Peace Direct has been working with local organizers to nurture a culture of peace. “Mindanao” doesn’t mean much to many people outside of the Philippines. Though the large southern island does have the white- sand beaches and aquamarine lagoons for which foreigners flock to the rest of the archipelago, Mindanao itself is not marketed as a tourist destination. To Filipinos, however, Mindanao can mean a lot—and not all of it good. Many from the northern part of the country buy into stereotypes that the island is dangerous: plagued by kidnappings, and a breeding ground for terrorism. These fears are largely overstated—the vast majority of the island’s population of 21 million has never been affected by violence—but not entirely unwarranted. Homes in the city of Marawi that were destroyed during last year’s war. ISIS graffiti is widespread in the destroyed city of Marawi in Mindanao, Philippines, where last year, a five-month battle raged between the Armed Forces of the Philippines (AFP) and a group affiliated with the Islamic State. Mindanao is home to a sizeable Muslim minority that has historically been marginalized by the government of this predominantly Catholic country. 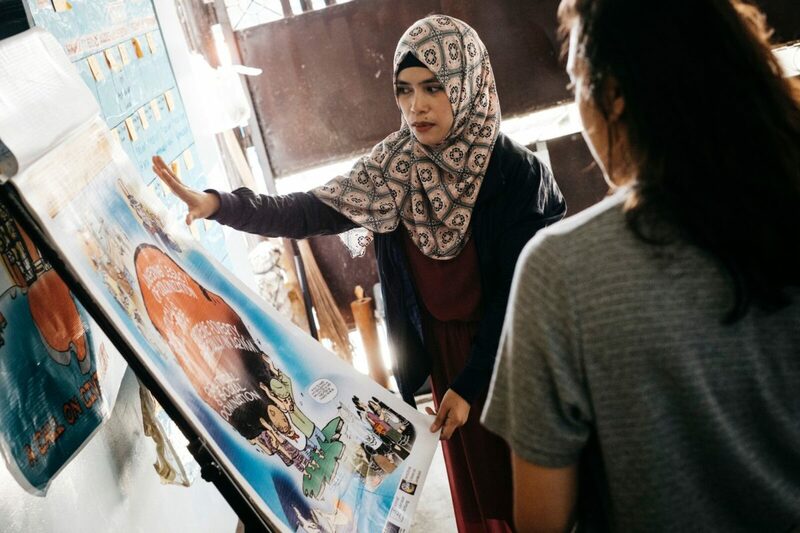 In response to what they perceive as ongoing discrimination, a coalition of rebel groups united in the 1970s to form a separatist movement that demanded increased autonomy for Bangsamoro, a Muslim nation. Most members of these groups put down their arms in 2014, when a peace agreement was signed with the Philippine government, but those unsatisfied by the government’s devolution efforts became more and more alienated, creating a fertile ground for recruitment by the Islamic State. In May 2017, a war between militants who pledged allegiance to ISIS and the Philippine Army destroyed the Muslim–majority city of Marawi and left hundreds of thousands of people displaced. The fighting didn’t end until that October; almost a year later, the city feels like a ghost town, open only to the military who are working to clear unexploded ordnance and skeletal remains. It can be easy for those of us in the West to mistakenly assume that the people we see on the news walking miles to flee from violence, standing in lines waiting for relief supplies, or cramming several families into a single tent in temporary camps have never lived lives similar to ours. The reality is that the effects of conflict are indiscriminate. 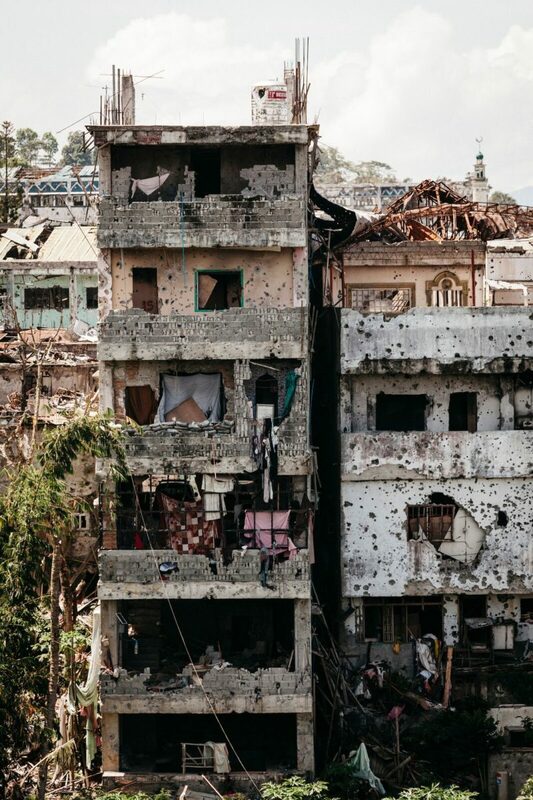 War doesn’t just impact the poor or those in rural areas, but those who live in bustling, modern cities—like the ones that are familiar to us, and like the one Marawi once was, too. 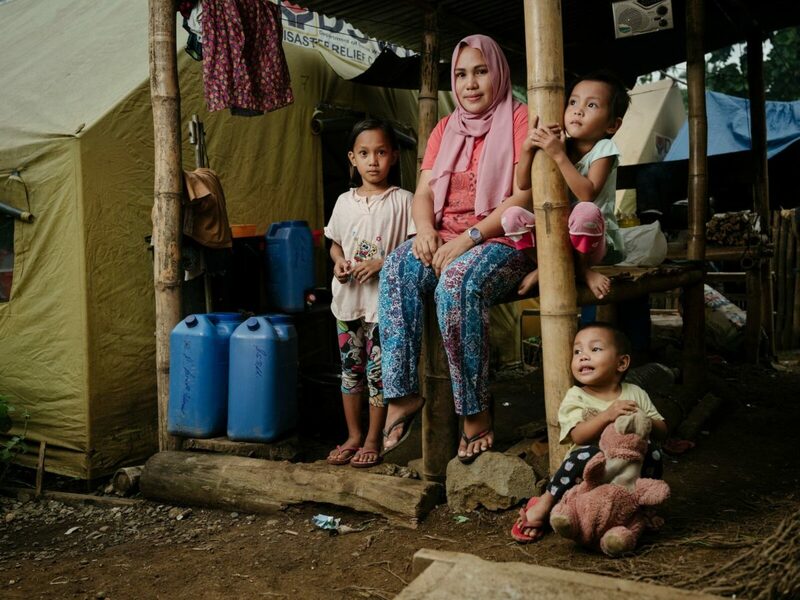 Nashiba and her three daughters, pictured outside the tent where they have been living since May 2017, when they were forced to flee Marawi. 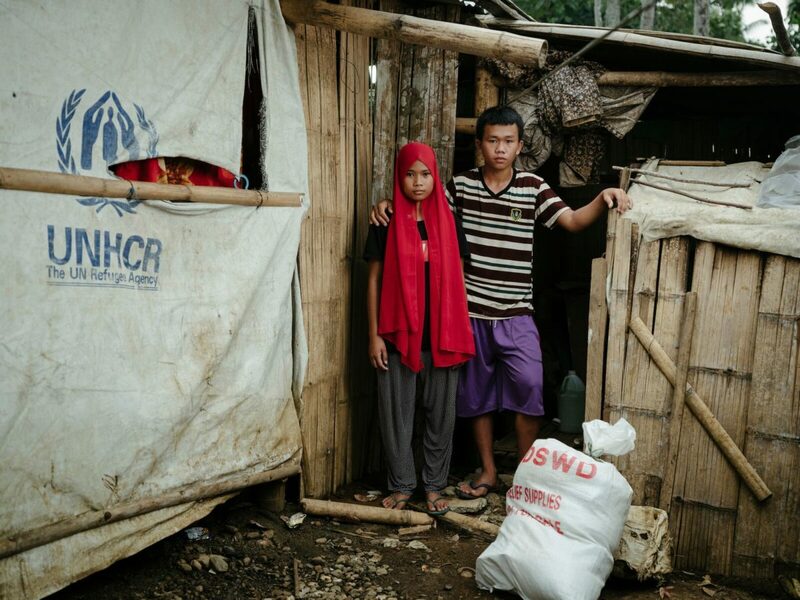 A young couple outside their tent in an IDP camp on the outskirts of Marawi. A member of a KI-supported women’s cooperative calibrates her sewing machine. It is only after spending a full day with Ashmin, a young woman displaced by the war, that I realized that she and her family were directly affected by last year’s conflict. We were trading beauty tips—mesmerized by her bright blue eyelashes, I noted down her go- to mascara brands—when she explained that she’d recently had her braces removed. Spending money on cosmetic dental treatments no longer makes sense, now that her family needs to save up for a new house, she told me. What had happened to her old house? It was razed during last year’s war. Ashmin explained how the siege began while she was at work in nearby Iligan City, and described the agonizing 24 hours during which she coordinated a way for her family, still in Marawi, to join her. Her mother and sister had locked themselves in the bathroom of their house to avoid being spotted by the ISIS combatants who roamed the streets. When a temporary ceasefire was declared that evening, the family escaped. Though it usually takes less than one hour, their drive from Marawi to Iligan City that night took more than eight. They eventually arrived safely. Since then, Ashmin and her family, who had lived for the past 23 years in a multistory compound, have been living in a rented single-room apartment. Just a few weeks before I met them, they had revisited their old home for the first time since fleeing, to see if there was anything they could salvage. All they came away with were two cups and two plates. “Just a memento of our old life,” Ashmin said with a little laugh. 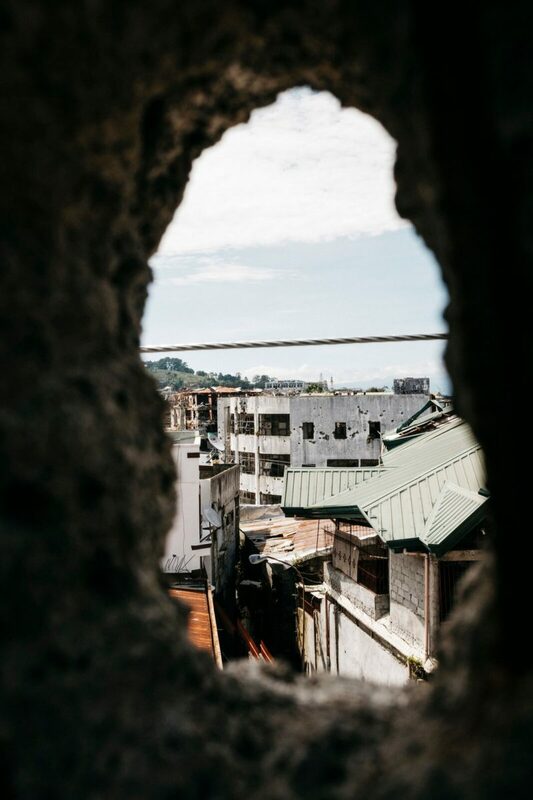 The view through a sniper loophole in the wall of a building in the destroyed city of Marawi. 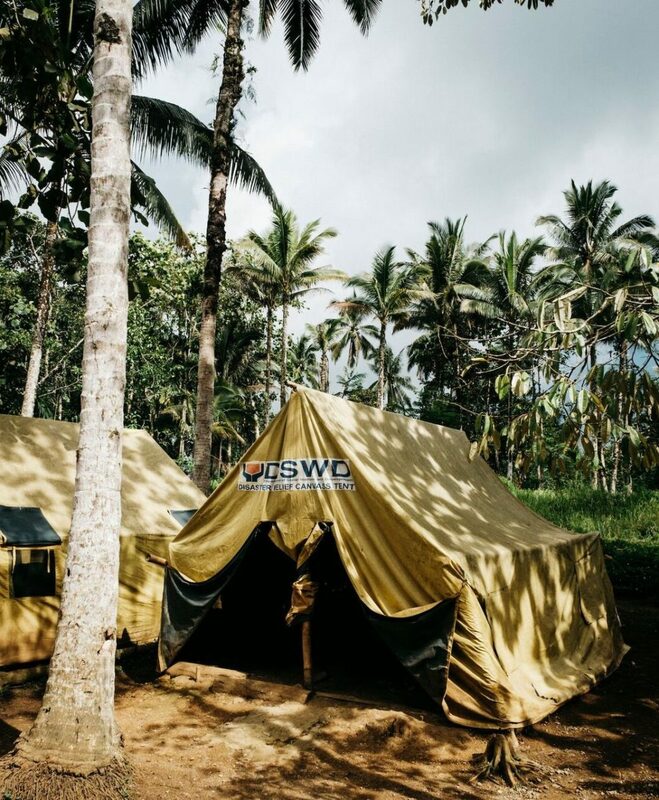 An IDP camp on the outskirts of Marawi. Each tent houses two or three families who have been living in the camp since the war started more than a year ago. 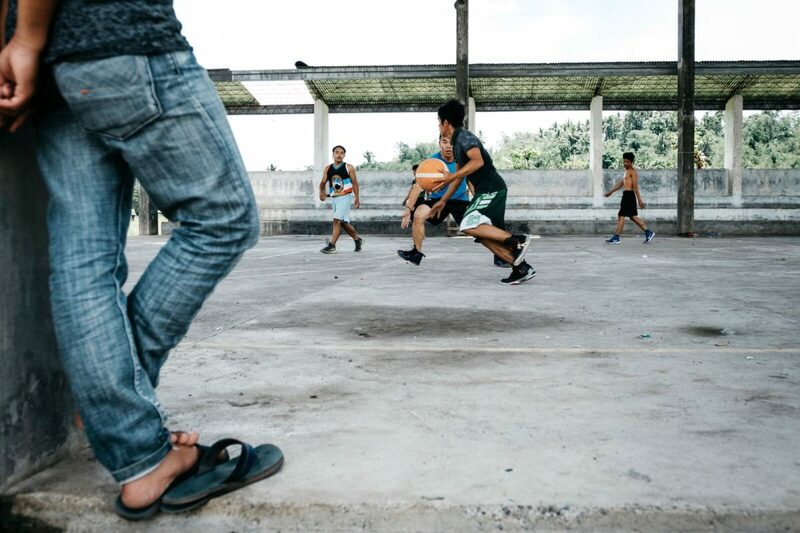 Young men play basketball in Butig, the town where leaders of the ISIS-affiliated groups were from. Ashmin, a community organizer for KI who was displaced by the Marawi war, talks through a presentation outlining causes of disenfranchisement in the Mindanao area. 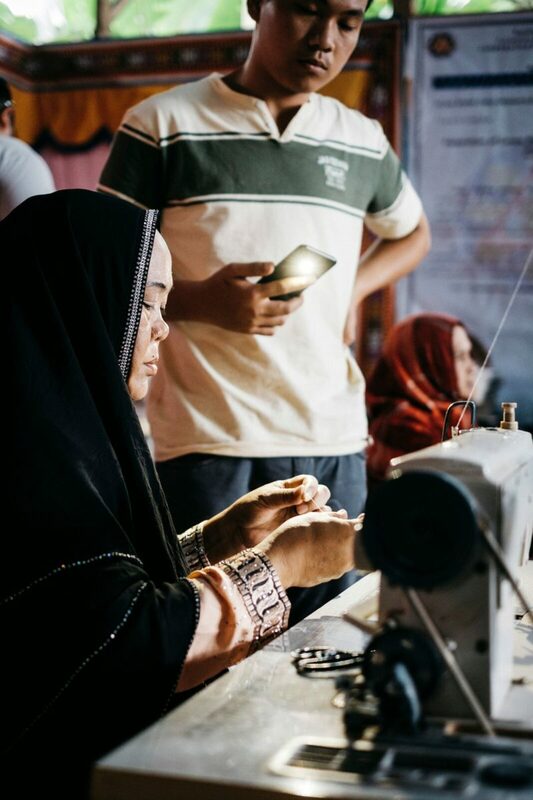 While Marawi is barely on the radar of international NGOs, local organizations like Peace Direct’s in-country partner, Kapamagogopa Inc., already have relationships with affected communities. Here, they are sponsoring IDP camps and developing programs to teach new skills to people whose businesses were destroyed. Most critically, they are continuing the work they have done for decades, building trust between the Muslim minority and Christian majority in the Philippines, to ensure that the societal divisions that enabled ISIS to take hold in the first place do not deepen further. I heard the Arabic word sabr, or perseverance, over and over again in my conversations with those who survived the Marawi siege. It’s an inspiring approach to processing loss, but we can offer the people of Marawi more than admiration. We can acknowledge the gravity of what they have experienced, and support those who are working to ensure that survivors can move beyond simply enduring, toward a life after the tragedy.